Craig Whyte's takeover of Rangers was sealed with a pound coin being tossed across a table in Sir David Murray's office, a court has heard. Mr Whyte, 46, is on trial at the High Court in Glasgow for acquiring the club by fraud, which he denies. The trial has heard Mr Whyte paid previous owner Sir David one pound for his majority shareholding. Phil Betts, who worked with Mr Whyte, said the coin was flipped in a "light-hearted" way at Sir David's lawyers. Mr Betts, a finance broker and a key associate in the buyout, told the court that someone then said: "Congratulations, you are now the owner of Glasgow Rangers football club". The witness recalled being at the May 2011 meeting as the businessman acquired Sir David's majority stake in the club. Mr Betts told how he took photos at the gathering which he described as being "light hearted". Mr Whyte denies a charge of fraud and a second allegation under the Companies Act in connection with the takeover. Mr Betts told how he got involved in Mr Whyte's bid for Rangers after first meeting him in 2009. The 54 year-old recalled Mr Whyte had wanted his interest to be "low profile". He told the trial Mr Whyte had wanted to raise £10m. But Mr Betts said Whyte later claimed he was "struggling" to do so and "could not understand why". Mr Betts then got in touch with a contact in the financial sector. This individual said he had someone who could help with funding. Mr Betts and Mr Whyte went on to meet this person at a Starbucks coffee shop near St Paul's in London, he said. It eventually resulted in a meeting with Ticketus, which "expressed an interest" in Mr Whyte's proposal. 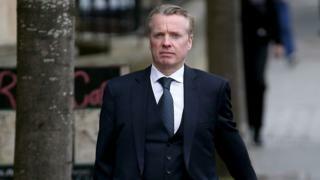 Prosecutors have said Mr Whyte took out a loan from the firm against three years season tickets to help fund the takeover. Mr Betts said Mr Whyte had been "pleased" at the Ticketus interest. But the witness added: "He then asked me to ask them would they consider £20m. "I think I laughed. I said I would ask as long as he was happy to receive a no." However, Mr Betts recalled "after some deliberation" Ticketus came back and said they would be "interested". Mr Whyte eventually struck a £1 deal with Sir David to take over at Rangers. Mr Betts told how he travelled to Edinburgh in May 2011 for the buyout to be completed. He said initially the trip to Scotland involved sitting in a lawyer's office "twiddling our thumbs". But the Whyte and Murray groups later went to Sir David's office in the capital. Prosecutor Alex Prentice QC asked Mr Betts if he photos at the meeting. Mr Betts: "Two or three - at the signing of the paperwork at the offices of the Murray group." Mr Prentice: "Once the signing occurred was a £1 coin provided?" Mr Betts replied: "There was, but I do not know from who. It was flicked across the table to the lawyers of the Murray Group. The advocate depute went on: "Was anything said?" Mr Betts: "Congratulations, you are now owner of Glasgow Rangers Football Club, I think." The trial before Judge Lady Stacey continues.